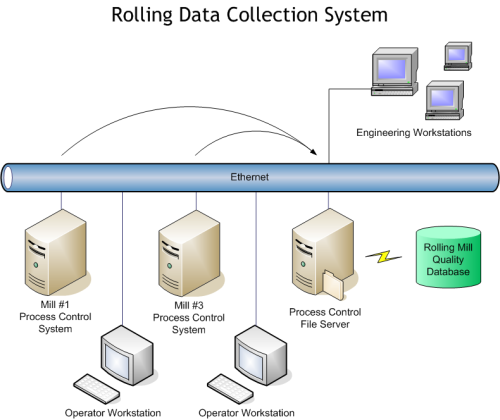 Rolling Data Collection System – Detailed Case Study – TelePro, Inc.
Software components would be built on process control systems to acquire the coil quality information in real time. Data would be acquired and accumulated on the currently operational Modcomp process control systems. Acquired data could be displayed in real time at mill operator's request. Data would automatically be transferred to another system and inserted into a long-term database. Current strip-chart based data logging hardware would be replaced. Coil History (all passes run on a given coil at all process centers). The system was implemented by modification of the current control programs in the process control system. The data was accumulated in global common areas to facilitate display by the operator interface system. Screens were designed and built to display the data in real time. When a coil is completed, the data is transferred to a store and forward system implemented for this project. This facility assures that no coil data would be lost in the event that the database system was unavailable at the end of coil processing. Data is transferred over a TCP/IP connection to a receiving directory on the Novell file server with site wide visibility. Coil data is available on this system for at least one year after the processing has been completed. The data is transferred as flat ASCII files. These files are easily built by the process control systems. A program in a server support processor then reads these files and inserts the process data into a Foxpro database. Several Foxpro applications were also built to digest the data and provide engineering calculations for the quality engineering staff. A set of screens were designed and implemented to provide for viewing and analysis of the flatness and gauge data. These screens are available on shop floor terminals and at engineering workstations. With these screens, engineers responsible for product quality can review the process center operations. If a problem is found in a coil, the history of that coil can quickly be viewed to determine where the problem may have originated. The system was installed and is operational. Operators, engineering staff and management personnel can view product quality data within minutes of a completed coil pass. The older data logging equipment, which had become a maintenance problem, was removed from service at a substantial cost savings. The store and forward portion of this system was used to meet other requirements for data reliability. A follow on project used this portion of the system when the manual accounting system (for time and accounting data) was replaced with an online system which required coil processing time and asset utilization information from the process control system. The initial system, designed to cover mills at two process centers, is being expanded to cover additional mills and heat treat facilities.